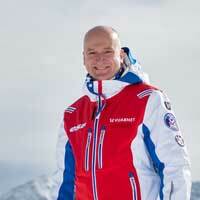 MH2ski is me, Martin Hemsley, a British ski instructor based in Méribel, France. With over 20 years’ experience in teaching and guiding skiers around the magnificent Three Valleys ski area, I have a passion for skiing in these mountains and am fully committed to ski teaching. My approach to ski instruction is to build what I do around your needs, not mine. You can read more about my approach to teaching you to ski here, and more about my ski lessons and guiding here. Whether I've met you in previous years, or this is your first time with me, I look forward to meeting you. I first put on skis at the age of 18. I was at a dry slope, at the Bowles Outdoor Centre in Tonbridge before my first-ever skiing holiday in Bulgaria. I soon realised how much fun could be had on skis. For many years of precious holiday time, I travelled the world every winter, searching for the snow and the mountains to satisfy my love of the sport. In Spring-time I was often found to be sulking for weeks after my last skiing trip each winter. This was all rectified when I handed in my notice at Andersen Consulting (now Accenture), sold my house in West Sussex and embarked upon the long and challenging journey to become qualified as a ski instructor. I now hold the highest instructing qualification available, BASI ISTD Level 4, and have gained full French equivalence. The Three Valleys ski area was one of my favourites as a holiday maker, so it is no surprise that I have based myself there. I taught in Courchevel for three winters, but am equally as happy teaching in Méribel where I have now spent more than seven winters. I also met my wife Harriet in Méribel, which makes it even more of a special place to me. I'm told that my love and passion for ski teaching, and for being in the mountains, is infectious. I love meeting new clients each winter but also welcoming back many regular clients who can’t wait to get their annual quota of skiing in the mountains with me. I am genuinely happy and proud to teach people of all levels and see their confidence grow. When out skiing myself, I'm always accompanied by my camera so that I can regularly update the MH2ski blog. During the summer months I live in Leamington Spa in Warwickshire. After many years working as a driving instructor, I have recently launched into a new summer career as a professional photographer, specialising in weddings and portraits. My hobbies include running, mountain biking and hill walking. One thing never changes though, I still sulk at the end of each winter. Click here hello@mh2ski.co.uk or use the form on the Contact page. Full phone contact details also on the Contact page.